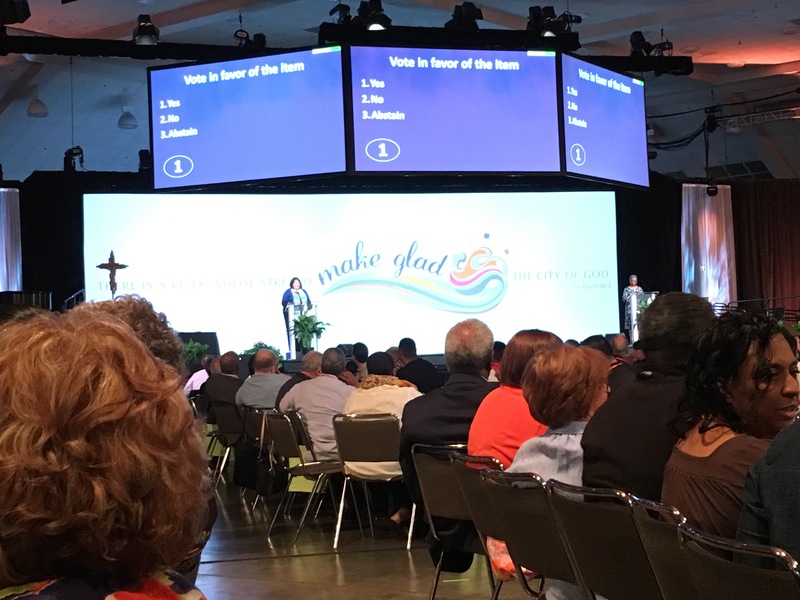 It’s Day One of the United Church of Christ General Synod, gathering in Baltimore, MD. A long, string of words pop into my head as I think about this day. Most of those words have something to do with the array of people assembled in this enormous convention center. Coming from Maine, I’m fully aware of how homogeneous my context is. 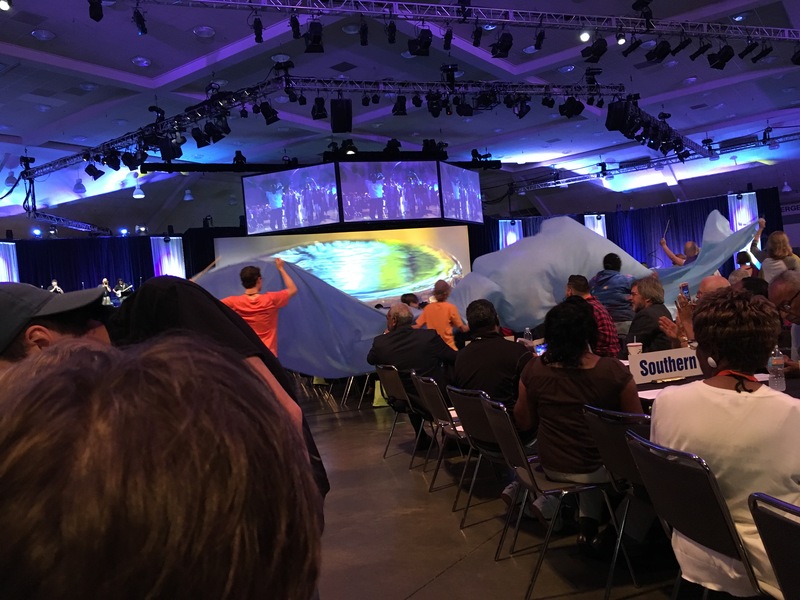 At Synod, I expected a very different experience. And, that has certainly been true. People of all shapes, sizes and colors are here. There’s also an interesting array of hair on display—some very colorful or arranged in an interesting presentation. And, as well, there’s a fascinating parade of mobility (something I didn’t really think about in advance)—with quite a few people on scooters and others with various aids in getting around, along with quite a few who walk with such purpose that it looks like anyone in their way may be in danger, and then a good number of people whose gait can best be described as strolling. While the beginning of the day was filled with (not very exciting) meetings, the real interesting stuff started mid-afternoon, when we gathered for worship. Again, I knew I was in for a remarkably different experience from what I’m used to. And, it was. I’m used to worship with 25-50 people, with the occasional holy day worship of around 100, along with a smattering of funerals where hundreds are in attendance. While it was a truly wonderful experience to be in that space, at worship, with people from all over the United States, I’ll also admit that there was something about it that I found not so fulfilling. In the huge crowd in attendance, worship possessed an element of anonymity. It really didn’t matter if I spoke the lines for the congregation. It really didn’t matter if I sang with the group. It was certainly a great experience to be in such a large room, with thousands of people singing, worshiping and praising. But, it was also impersonal. Day One is not quite done. I still have a committee meeting to attend this evening. So far, it’s a mixed experience. On the one hand, it’s an incredible experience to be in a room full of such a remarkable diversity of humanity, of God’s creation. But, it’s not where I would want to be on a regular basis. Sure, big and diverse is great. But, small and intimate is also great.